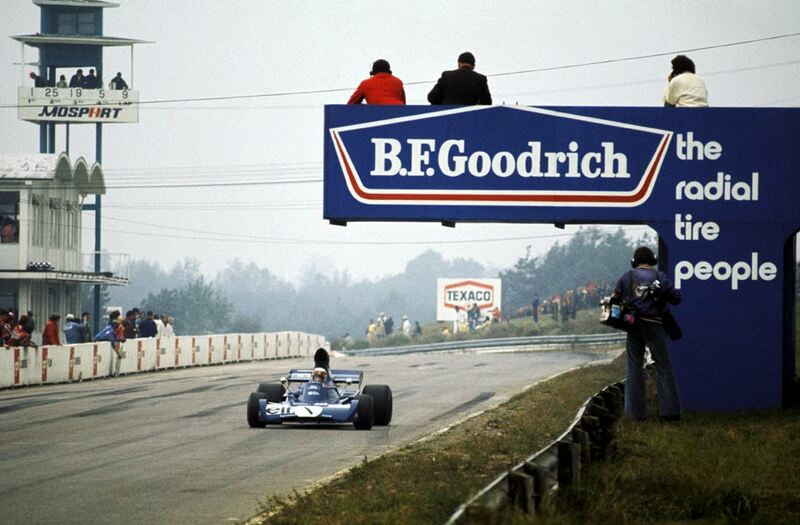 Jackie Stewart won the penultimate race of the season at the extensively-resurfaced Mosport Park circuit as he debuted the new Tyrrell 005. Peter Revson secured pole position in his McLaren and his team-mate Denny Hulme qualified second ahead of Ronnie Peterson's March. The start of the race was delayed by fog and the weather cleared a little to allow the race to begin and Peterson led away with Stewart in pursuit. Denny Hulme settled into third but Revson made an awful start and fell to mid-grid. On lap four, Peterson made a mistake and lost his lead to Stewart's Tyrrell as Jacky Ickx harried Revson who was recovering form his poor start. Ickx muscled his way past but the Ferrari then lost power and Ickx fell back through the pack. Peterson continued to run second behind Stewart until he came up to lap a stubborn Graham Hill on lap 54. The Brabham refused to move out of the way of the Swedish flyer and the two cars touched, damaging the steering on the March. Peterson stopped at the end of the pit lane and was pushed back to his garage before rejoining. He was later excluded for the push start. Hill soldiered on to finish eighth as the battle for second raged between Revson and Emerson Fittipaldi's Lotus. In challenging for the place, contact was made and the Brazilian damaged the nose of his car and had to pit for repairs. It allowed Revson to secure second behind Stewart with the second McLaren of Hulme inheriting third after Clay Regazzoni clipped backmarker Skip Barber and Carlos Reutemann ran out of fuel.